Two representatives from the steering committee of Demand Redesign, Susan Stringer and Montse Shepherd, presented a statement to city council on Wednesday, January 28th regarding the development by Dan Neal of Paradigm Properties at NE 7th Avenue and NE Russell Street. Mayor Hales and all four commissioners were present and were very attentive to the issues, concerns and recommendations they presented. They addressed the potential impact on street parking, dangerous congestion at the entrance and exit to the parking garage, traffic speed issues south of Knott Street and the lack of a visible crosswalk at Brazee Street. They also requested that the city ask the developer to reduce the height of the building to 45 feet which is the maximum allowed per the proposed Portland Comprehensive Plan’s down zoning of the lot to R1 medium density. Without any action from the city council the neighborhood is facing a 6 story 62 unit apartment building which is grossly out of scale and character with the rest of the neighborhood. They are awaiting a response from the Mayor’s office but in the meantime we urge residents to email or call the city council members and express their concerns. Also, the comment period for the Portland Comprehensive Plan has been extended to March 13th so if anyone has not commented on the zoning for that lot (2603 NE 7th Ave), please take a moment to do so. Demand Redesign thanks the community for its ongoing support and future updates can be found on their website. 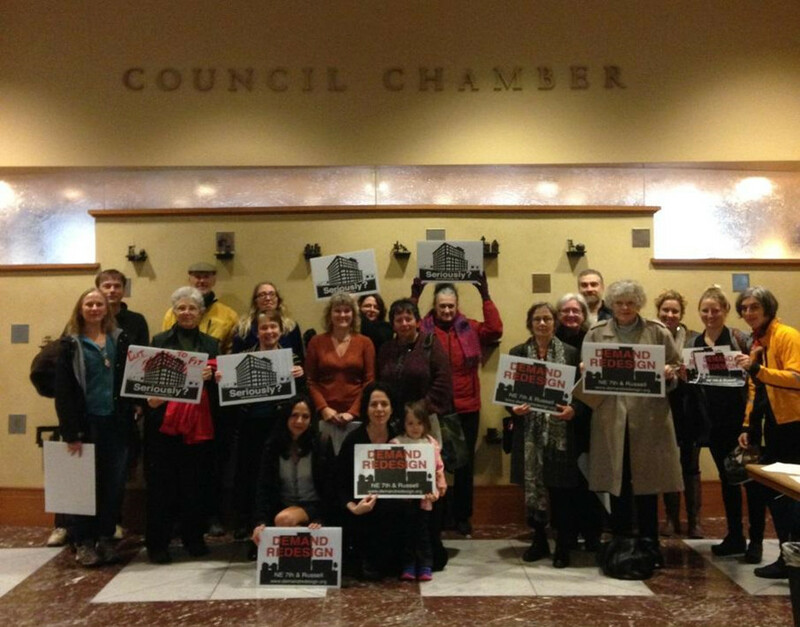 Why don’t you people on the city council, oh say like Steve Novick, get off your duffs and stop pitching this crap about these giant multiplex buildings being better for the city and our neighborhoods, and start remembering they are NEIGHBORHOODS!! And in the case of Elliot, a neighborhood that has already been drawn and quartered several times…..